EyeWire, neuroscience’s most audacious experiment, just opened up a digital museum. Constructed with the help of a quarter million gamers, EyeWire Museum is one-of-a-kind: the 3D interactive playground showcases neurons in a mouse’s retina in exquisite detail, down to every bend and turn in a cell’s sinuous branches. Unlike previous “brain atlases,” EyeWire Museum doesn’t just chart the physical structure of its neurons. 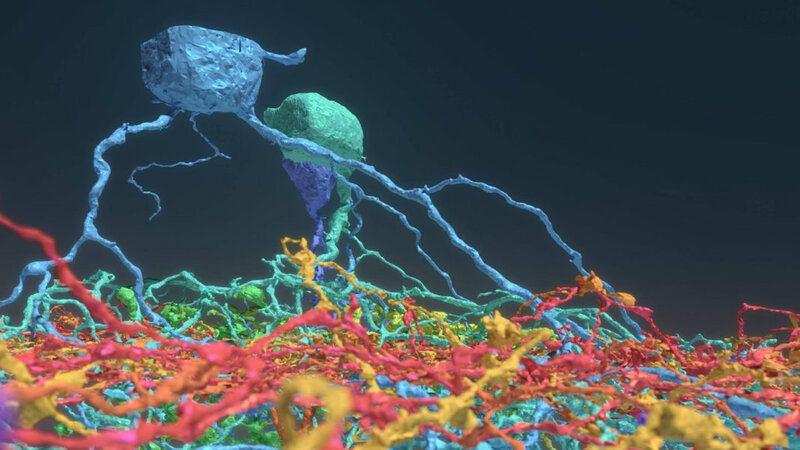 Ripe for exploration are data about how individual neurons spring to action. Like humans, each neuron has its own character: in the light of stimuli, some may choose to respond quickly but soon shut off; others may activate in a slow burn. The new museum contains these functional data for exploration. Linking physical structure to functional data is extremely rare. Making it available at the level of single cells—roughly 400 in total—is even rarer. The museum isn’t just aesthetically pleasing. Releasing it open-source to the neuroscience community offers a detailed, expansive resource that could help collaborations in projects such as retinal prosthetics. As the light sensor and first stage of visual processing in the brain, the retina holds the key to how our brains process images with such ease. Unveiling their secrets could even help machine vision scientists construct AI systems that mimic nature’s solution to vision. “This interactive viewer is a huge asset for these larger collaborations, especially among people who are not physically in the same lab,” said Amy Robinson Sterling, the executive director of EyeWire. It’s a significant contribution, said Dr. Marla Feller at UC Berkeley’s Department of Molecular and Cell Biology & Helen Wills Neuroscience Institute, who was not involved in the research. You can check the museum for yourself here. The results were published in the prestigious academic journal Cell, with—hooray!—credit to the EyeWire players that made it happen. When Sebastian Seung left a promising career in theoretical neuroscience in 2005 for brain mapping, his colleagues thought he was crazy. Although projects that “map the brain” seem commonplace these days, the idea was inconceivable a mere decade ago. The scale alone is staggering: the human brain contains 80 billion neurons densely packed into a space smaller than a football. Untangling the trillions of connections that neurons make is like tracing a single string of spaghetti in a bowl the size of the Pacific Ocean. Yet Seung saw the potential in charting the brain’s unexplored connectivity. The theoretical physicist-turned-neuroscientist is an early evangelist for connectomics, a wild plan to map the functional connections between neurons in an effort to figure out how the brain works. In a popular TED talk, Seung laid out his theory of “you are your connectome”: every memory, experience, and personality trait that makes you you is stored within the physical structure of the connections in your brain. Reconstruct the connectome and—in theory—scientists may be able to reconstruct you. Imaging the brain is a crazy complicated engineering project. First, scientists treat the brain with chemicals so it doesn’t melt into mush when it’s extracted. The entire brain is then sliced into wafer-thin sections on a machine that looks somewhat like a deli meat slicer. Each section is then carefully imaged under powerful microscopes, a tiny snippet at a time, and the resulting images are pieced together in files on the scale of gigabytes per section. Even harder work comes after the images are assembled. When Seung began his then-unorthodox pursuit of connectomics, he estimated that it would take a single human tracer roughly a million years to trace all the neurons and their branches in a cubic millimeter of human cortex. An entire human brain would require a trillion years. Obviously he needed some help. His solution? Gamify brain mapping. In 2012, when Angry Birds was in its prime, Seung had an inspiration. Although the initial idea was to use deep learning-based AI tools to reconstruct the neurons, humans were—and still are—better at spotting the patterns of neuronal branches and connectors than machines. Collaborating with Dr. Kevin Slavin, a fellow professor at MIT with a background in game design, Seung tried to make a game about brain tracing as enthralling as a first-person shooter. Spoiler: you can’t. Since its inception, the game has garnered some die-hard fans (and an anime-style intro on the website) with its numerous achievement badges, a scoreboard and swag for competitions. Nevertheless, EyeWire still resembles a game you would “play” in biology class, and the 265,000 plus gamers contributing do it “for science!” rather than as nighttime relaxation. In the game, each player is given a tiny cube of the retinal tissue, about 4.5 microns wide—that’s about the width of a human hair for a 10-by-10 block of cubes. To ensure accuracy, each cell is reviewed by between 5 and 25 gamers—if the results match up, the trace is accepted by the game as being complete. These traces are then fed as “training data” to the deep learning algorithm, which learns to better recognize individual neuronal branches among a giant tangled mass. Eventually the goal is to automate the entire process. While a pipe dream just five years ago, the power of deep learning in biology has been transformative. A recent study used a powerful algorithm to identify dead neurons in microscope-generated images, a task normally relegated to junior neuroscientist trainees. As more data pours in, EyeWire may eventually learn to self-map, and such a strategy could be adopted to explore other regions in the brain in other species. The biggest surprise in the latest EyeWire Museum release is the discovery of six new types of retinal cells. Just a few years ago, scientists estimated the number of ganglion cells—the major cell type in the retina—to be around 15 to 20. The team found more than 35 types. “There’s a little sliver of a mouse retina, and almost 10 years later, we’re still learning things from it,” said Seung. Making sense of the roughly 400 densely packed retinal cells was a challenge. “The prior studies were limited to tens of neurons sparsely sampled from a single individual,” explained Seung and his team. Here, they found that different cells grow along different physical planes in the retina—in fact, a brief look in the museum shows how remarkably flat these cells are stretched in space, compared to a neuron in the cortex. Unlike previous brain atlases, EyeWire lets its users browse multiple neurons at the same time—rather than a single reconstruction. This simultaneous display lets scientists visualize overlaps between the neuron’s branches as potential points of connection, explained the authors. These may just be among the first discoveries as scientists around the globe experiment with the dataset.